2011 looks set to be another great year for superhero action movies – Thor, Green Lantern, yet more in the X-Men and Transformers sagas, and the hotly awaited Captain America: The First Avenger, starring Chris Evans (no stranger to Lycra after his turns as Johnny Storm in the Fantastic Four films) will all be hitting the big screen this year. Superhero flicks, of course, bring with them a slew of merchandising and a deafening kerching! as the tie-in products fly off shelves...or gather dust if they bomb at the box office, only to land in the bargain bin months later! 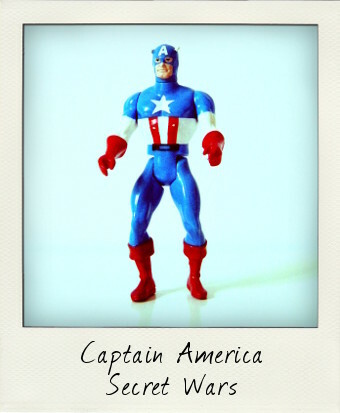 Personally, I'm looking forward to seeing a Chris Evans as Steve Rogers aka Captain America action figure, but in the meantime here's a vintage Captain America from a classic line – the Marvel Super Heroes Secret Wars by Mattel. Mattel's Secret Wars 5 inch action figure series featuring superheroes from the Marvel Universe first appeared in 1984 and was very much a rival toy line to Kenner's Super Powers based on DC Comics superheroes and supervillains. In fact, Marvel Comics' Secret Wars comic book mini-series was published specifically to launch the product line. 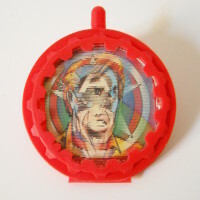 Whilst the articulation in the Secret Wars figures was far more limited – five points only at the neck, shoulders and hips - and they lacked the action feature that was the trademark of Kenner's Super Powers, the Mattel figures proved to be a hit and alongside Super Powers are some of the most sought after vintage action figures from the 1980s amongst collectors today. Captain America was issued as part of the first series (which included a satisfying mix of good and bad guys Spiderman, Dr. Doom, Magneto, Iron Man, Wolverine, Kang and Dr. Octopus) and is still one of the best Captain America figures ever produced. The sculpt is impressive and the costume is spot on, although finding a figure with torso stripes and “A” intact is tricky, as these figures suffered from almost immediate paint wear problems. In fact, my Captain America is in great shape with only minimal rubbing – the “ears” on his cowl and “A” are still pristine! 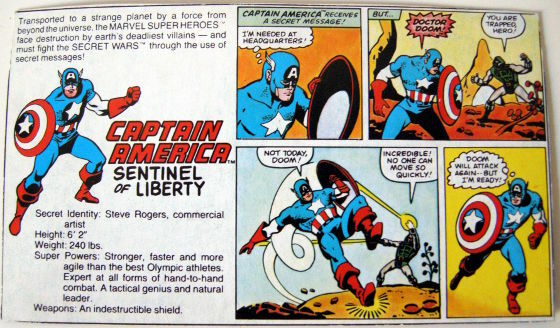 My only gripe would be that in this line his iconic shield has been replaced by a Secret Wars Secret Shield, a standard issue gimmick that came with all the figures – these shields can be opened and a two-sided lenticular image discs inserted that changes when tilted and viewed from different angles. This vintage Captain America has this accessory, although I'm more than happy to display him without and would have preferred his regular shield! He’s a beauty! I had Doc Oc, Kang, and STILL have my Dr. Doom! I had Cap as a kid and own one now as well!I also felt like he should have come with his original shield.Call me crazy but no Marvel figure to date can compete with the ’84 line.